Though the NBA has plenty of fully developed all-stars, the league is also full of great young players flowing with potential. Here is my starting five of players under 23 that are most likely to be some of the best players in the league in the next couple of years. Russell was drafted second by the Lakers in 2015 at the age of 19. Now in his second year in the league, there are a lot of high expectation for his future. D’Angelo is averaging about 15 points and 5 assists per game, and he has also proven to be clutch on a couple of occasions. One thing that is certainly a possible worry is his maturity. His off the court incident with his teammate Nick Young stirred up a lot of questions on whether his teammates would trust him, and if he could handle himself in a good manner. Aside from that though, he does have a lot of talent, and many of teams of are thinking he could be a franchise player type of guy. 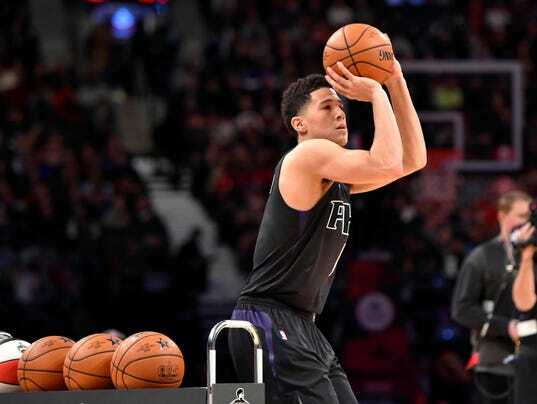 Devin Booker is a twenty year old shooting guard who shot his way into the three point competition in his rookie year, finishing third only behind Steph Curry and Klay Thompson. Devin Book has started out the year averaging 19 points per game, and has a lot of potential in his game. He is a very good three point shooter, and some are even saying that he could be the next Curry like player. Also, many experts have predicted him to make an appearance on the 2020 USA Olympic team. In a survey where every general manager in the league was asked who the most likely player to have a breakout season, Devin Booker finished first with 13% of votes, second place getting only 13.8%. This shows that there is real potential in him, and he is being recognized by more than just fans. Giannis Antetokounmpo is a 22 year old small forward, playing his fourth year in the league, and has loads of potential. He is just under seven feet at 6’11” which gives him a great advantage over most of his opponents. He has at least an inch or two on most of the other small forwards in this league, and is just as agile as most of them. Giannis is off to a great start this year, leading his team in points, rebounds, steals, and blocks. This might say more about the Bucks then it does for him, but compared to the other small forwards around the league, his stats are just as staggering. He leads small forwards in blocks, and is in second in rebounds, steals, field goal percentage, and assist. He is also in fifth in scoring. He is leading some of the best small forwards in the league in these stats. He is also ranked fourth in player efficiency rating, which is above the fifth place Lebron James, who is arguably the best player in the league. That is undoubtedly a very impressive stat. This may be a surprise, but he still has a lot of room for improvement, and some flaws still in his game. The biggest flaw which is apparent to many, is his mid-deep range shooting. He only averages one three pointer made every two games, and only makes 72% of his shots from the free throw line. Shooting is something that can be learned through practice. If Giannis can up his three point shooting, where he can knock down open shots, and be good enough where the team is comfortable having the ball in his hands to knock down a clutch three, he will be a huge threat in this league. Anthony Davis is the only 23 years old in his fifth season, and he is already considered one of the best players in this league. Anthony Davis has already developed very well in this league, but due to his young age he still qualifies for this list. Many people are saying that Anthony Davis has had the best start to this season, leading the league in scoring and blocks per game, and ranking sixth in rebounds per game. Even with those monstrous stats, he has had a pretty unfortunate season. Davis started the season scoring 50 during the season opener, and 45 the next game. His team the Pelicans lost both of those games. The Pelicans started out losing their first eight games, and are now 7-15. This isn’t exactly the worst record in the league, but for having the league’s leading scorer, it’s pretty bad. Many people feel that if Davis can get to a better team, or get some talent around him, he could be even better, and could be the best player in the league in the next couple of years. The future certainly looks bright for Anthony Davis, and that is why he made this list. Karl-Anthony Towns is in his second year in the league, and is already putting up big numbers. The 21 year old seven footer is already shocking the world with his unmatched versatility. Karl-Anthony Towns in the starting center for the Timberwolves, and is putting up great numbers in this league already. He averaged 18.3 points per game last season, and is averaging 22 a game so far this year. The most impressive part of his game, is his versatility. He can knock down the three point shot well enough so that you have to guard him out there. His ball handling is also more like that of a small forward than a center. He is quicker than most of the other centers he would be facing, so if they step up on him at the three point line, he can get around them fairly easily. He is so versatile, he even won the NBA skills competition as a rookie last year, being the first big man to win it in the history of the competition. This doesn’t mean he is a pushover under the rim. He has been averaging just over ten rebounds a game for his career, and also about 1.5 blocks per game. With this range of ability from a seven footer, it it hard to imagine him not becoming a star in this league.